The Halo Vault: What is the first record of a halo from Lowitz orientation with 315 /325 raypath? What is the first record of a halo from Lowitz orientation with 315 /325 raypath? 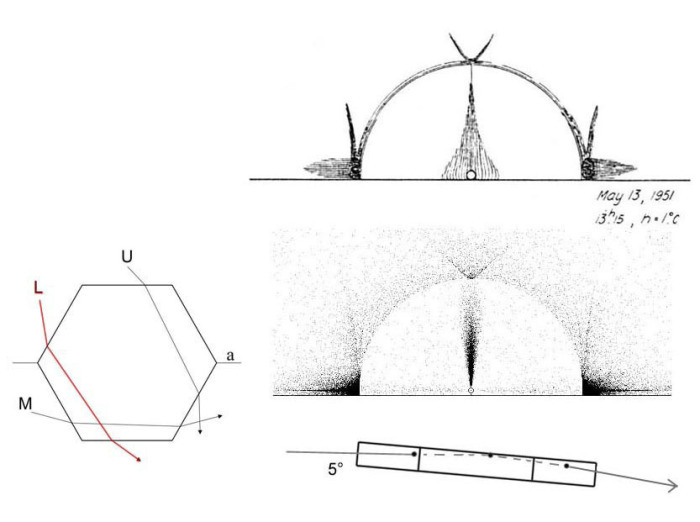 I am wondering what is the first record of halo from Lowitz oriented crystals with raypaths 315 and 325 respectively above and below parhelion? 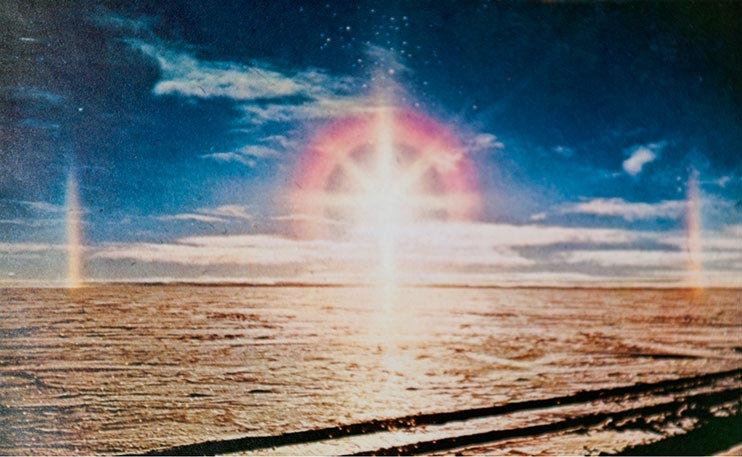 It has been called as "reflected Lowitz arc" and parhelion legs and arms. People are also calling it just Lowitz arcs, but it is not the same halo as Lowitz arcs which have 35 raypath. (From Parry orientation 35 make the Parry arc and 315/325 the Hastings arc and from column orientation you get tangent arc and Wegener arc). Above are some some early observations related to this halo. First is observation by Gösta Liljequist in the Antarctic on 13. May 1951 of the 315 arc. I have included also simulation (made with HaloSim software) and crystal figures depicting the raypath of this arc. That is a pretty realible looking observation. Second is a photo from the French Greenland expedition, taken on 21.7.1951. These are peculiar looking parhelia and one could argue that there is actually no parhelia at all, but this is less convincing documentation for the 315/325 arcs. The photo is from Readers Digest world map book from the 70's (thanks for Jukka Ruoskanen for scanning it). 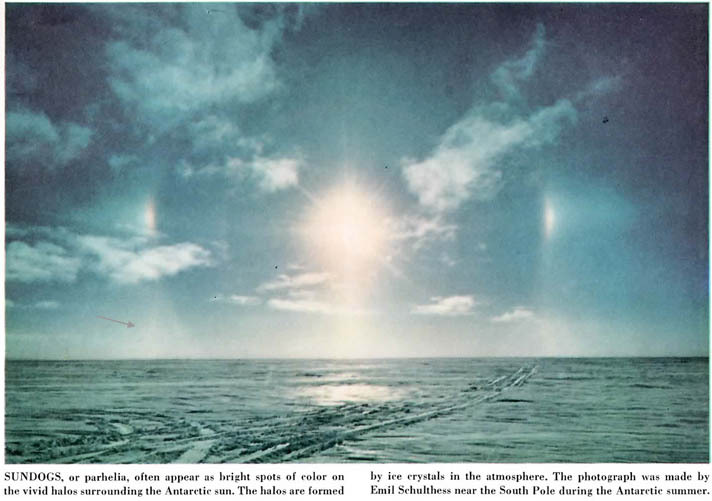 Third is photo by Emil Schulthess in the antarctic in 1957 from Scientific American 1962 September issue. Here we are seeing the 325 arcs at the horizon, marked with an arrow. And fourth is Paul Schultz photo from 1905-06 in Alaska. I strongly suspect the arcs here were not actually inclining outwards, but it is rather due to camera projection when the display was placed at the top of the frame (and then the photo was cropped). The last photo is mine showing similar projection distortion effect of normal parhelia when the halos are placed at the top of the frame. So, from all this it looks like Liljequist made the first convincing observation of the Lowitz-orientation 315/325 halo and Emil Schulthess took the first photo. I wonder if anyone knows any earlier photos? I have this strange recollection of a guy named P. Stahl having taken a photo of it in the 1951 French Greenland expedition, other than the one above. And that it would appear in some world map book. The photo would be similar in manner to the Schulthess photo. Possibly I just saw Schulthess photo and somehow mixed up the names, decade old memories are not to be trusted.